DSE continues to showcase new additions to the DSE 2019 line up. - The Adomni Ad Marketplace for BrightSign enables media player operators to drive new ad revenue by listing and selling their digital signage on Adomni.com. Media player owners can choose to switch to using the Adomni online CMS or continue using BrightAuthor CMS capabilities with the embedded Ad Marketplace widget. - iBase Technology’s SW-101-N waterproof digital signage player is fanless and designed for both indoor and outdoor environments, built to withstand dust, water and extreme temperatures, ensuring the system’s stable operation and reliability in harsh outdoor environments. It meets IP68 standards, allowing it to handle submersion in water for up to 30 minutes at a depth of 1.5 meters. - NEXCOM’s NDiS M539 is an OPS PLUS-compliant media engine powered by 8th generation Intel Core processor. It leverages the latest processors to deliver outstanding graphics support via multiple independent 4K2K video output. 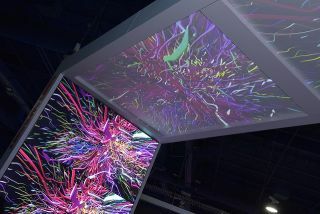 The superb, but power-efficient NDiS M539 can therefore maximize visual impacts for applications such as digital signage, interactive whiteboard, and video walls. - AxisTV Signage Suite is the latest release of Visix’s digital signage CMS, with drag-n-drop widgets for building interactive content and data-triggered message elements. Using configurable widgets, clients can automate text, artwork and design changes on screens, all triggered by external data sources. - Zytronic will demonstrate a new Hybrid Touch technology that enables full integration of physical controls within an active touchscreen. Zytronic’s Hybrid Touch allows mechanical buttons and dials to be incorporated in the active area of projected capacitive touchscreens, which can be used in video walls, touch tables and kiosks.